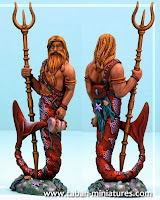 Harpoons are used by the Nauticans to fend off monstrosities of the deep from their underwater settlements. Tripoon units consist of 3 harpoons which operate in unison targeting the same enemy each time they fire. 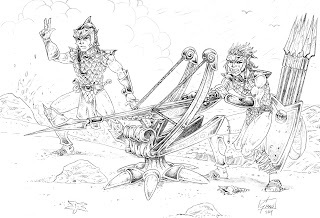 The harpoons resemble their land based counterpart the bolt thrower with the exception of the "bolt" itself which is often tipped with large barbs and hooks to cause maximum damage to single targets. Harpoons are unwieldy and not as refined for battlefield purposes as the common bolt thrower. Tripoon units are trained to fire as one to ensure that at least one harpoon hits it's quarry and does enough to deter large monsters from venturing any closer. The spear from a harpoon is designed to cause maximum (hopefully mortal !) trauma to it's target. Harpoons do not penetrate multiple ranks. Unsaved wounds from a harpoon cannot be regenerated. Tripoon units are fixed position weapons and cannot move except to pivot on the spot. The benefit of grouping harpoons into batteries of three is that all of the tripoon crewmen are in close proximity to one another and can help their fellow comrades load and aim the harpoons when casualties are suffered. The death of crewmen therefore has less of an impact on the operation of a tripoon battery than it would have on three separate bolt throwers. * the machine can be fired normally one last time (but will miss a whole turn thereafter).